In the Hospitals Investigator number 5 the following list of suppliers of temporary hospital buildings was given: Humphrey’s of Knightsbridge; Boulton and Paul of Norwich; Portable Building Company of Manchester; Hygienic Constructions and Portable Buildings Ltd; Wire Wove Roofing Company of London; G. W. Beattie of Putney; and Kenman and Sons of Dublin. To this list should be added Spiers and Co. of Glasgow, prolific providers of isolation hospitals pretty much throughout Scotland. The Hygienic Constructions and Portable Buildings Ltd were the agents for temporary buildings constructed on the Doecker system invented by Captain Döcker (usually rendered Doecker in English) of the Royal Danish Army. 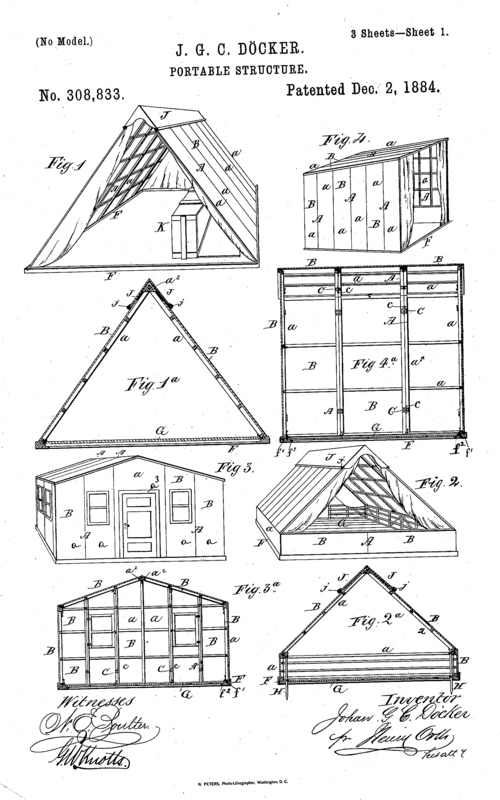 Johann Gerhard Clemens Döcker (1828-1904) first patented his portable building system in 1880. (He filed patents in France and Germany in October 1880, in Denmark and Austria-Hungary in 1881, in Norway, England, Spain, Belgium, and Italy in 1882; in Russia, Sweden and Victoria in 1883; and in New Zealand and the United States in 1884.) 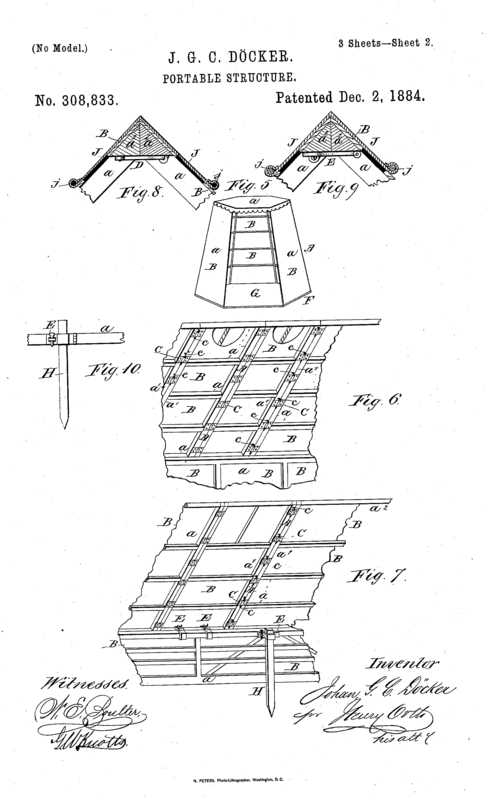 The full text of the patent he submitted in the United States can be read online here http://www.google.com/patents/US308833. ‘My improved portable and impermeable structure is composed of a series of light frames which may be made of wood or metal, and for general purposes such frames are polygonal in shape. Each frame a is covered with a sheet of impermeable material, permanently connected therewith in any suitable manner, as by nailing, riveting, or gluing. 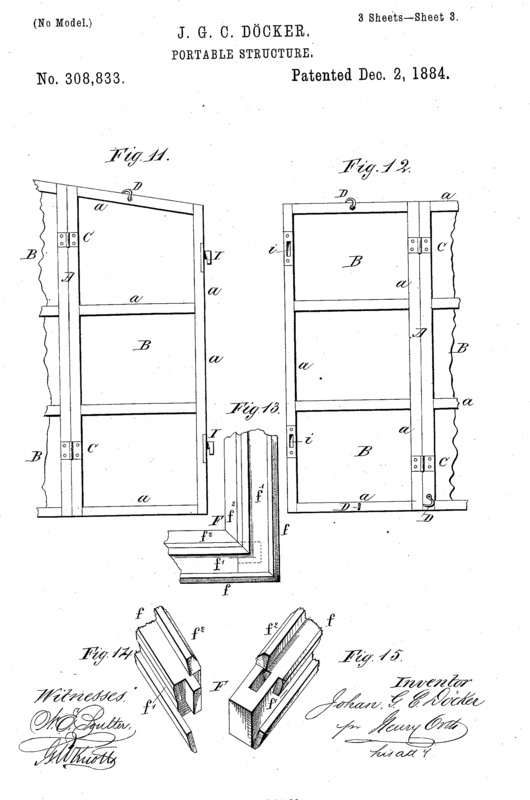 Two such frames are permanently hinged together by means of any suitable form of hinge, and a pair of such frames constitute a panel. 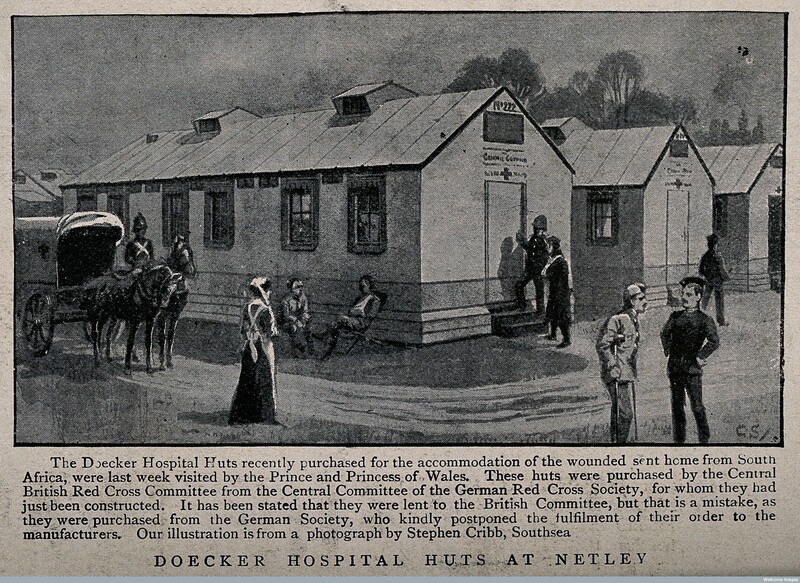 The term Doecker hospital was sometimes used generally for portable hospital buildings, whether or not they were in fact of Doecker construction. Doecker buildings were largely used on the continent, and in Britain were also used for elementary and open-air schools. There were two types: strong or light. The strong type were intended asa a substitute for permanent brick or stone buildings, while the light were for temporary and/or portable buildings, which could be put up quickly and cheaply. For both types the buildings were made in sections roughly 3ft x 3ft (a little less than a metre squared). These sections could be fastened together with iron hooks and studs, allowing for de-construction and re-erection on another site. The strong type comprised timber frames weather-boarded on the outer side and covered on the inside with a composition called ‘Doecker material’ – a non-inflammable, water- and acid-proof. These two layers provided a cavity that was filled with insulating material, though the walls were only 4 1/2 inches thick (about 11 cm). The roof was covered with a flexible and water-proof material (‘ruberoyd’). The light construction had a lighter frame covered on both sides by Doecker material. The whole building was made in sections, and the packing formed the floor ‘thus saving weight, space, and freight in transit’. No foundations were required, the building sat on adjustable wooden feet. Constructed these light buildings measured 50ft x 16ft (15.24m x 4.8m) and could be erected in one day by unskilled labour. 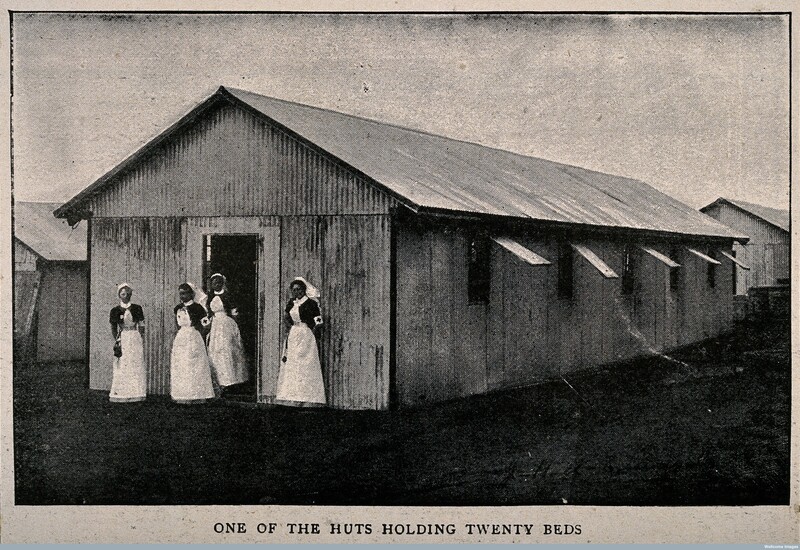 Their insulation properties were commended: ‘Portable hospitals of this construction were used by the German Red Cross Society during the cold of a Manchurian winter in the Russo-Japanese war, and they have also been used in the tropical heat of South-West Africa’. Doecker system hospital buildings, along with other prefabricated buildings, featured in H. Franklin Parson’s book Isolation Hospitals, originally published in 1914 and revised in 1922 by R. Bruce Low. This hospital pavilion, with is sun-catching angled wards, was a type provided by the Hygienic Constructions and Portable Buildings Ltd, Stockholm Road, South Bermondsey. The 1922 second edition formed part of a series of books on public health and hygiene (the Cambridge Public Health series) designed to advise those working for the government and the medical profession. It addressed the way in which infectious diseases were contained and treated, and defended the government’s decision to spend a significant amount of money on isolation hospitals. Parsons and Low discussed the most advantageous designs and locations for these institutions, the containment of diseases such as small pox and tuberculosis, and the issues that arose around both the staffing of isolation hospitals and the changing provisions made for those patients affected by severe poverty. This entry was posted in architectural plans, Temporary Hospitals and tagged history, hospital, medical history, temporary buildings. Bookmark the permalink. Thank you for this very useful information. In Mayland, Essex, we have a community building brought here by road in July 1908 (in a great hurry as it had to be “cleared this week from the site in Kingsway, London” having been purchased by Joseph Fels for use as a “Temporary School” for the infant children of farmers and agricultural workers in his Mayland experiemental colony. It could well be a Ducker or Doecker building that had been “approved by L.C.C.”. We are researching what this building was doing in Kingsway before its purchase and whether it came from Canada as the first demountable building in England – which is the local story & maybe just a myth & legend. There is no clue in the letter written to Maldon Rural District Council by Thomas Smith, the manager of Fels’ smallholdings experiment in Mayland. It may have been connected to the great deal of activity in London in 1908 – i.e. the Franco-British Exhibition, whose organisers also funded of the building cost of the Stadium for the 1908 Olympics close by (subsequently named The White City & White City Stadium). Also tramway works and slum clearance could have required temporary buildings or even another Open Air School or hospital project. There are records from 1924 when this building was gifted to the village for community use by the family of Henry Samuel, who had purchased Nipsells Farm, Mayland (& presumably also the hall) from Joseph Fels in 1912. The building is still used by villagers to this day. A lovely Open Air School was built to the western side of the hall in 1909 but has sadly been allowed to decay.